The tambourine drum is big enough. It’s just the right size for a jam session. Because of its 10-inch diameter, and double row jingles, it can be used by both adults and children, for any music or holiday events at home, work or school. 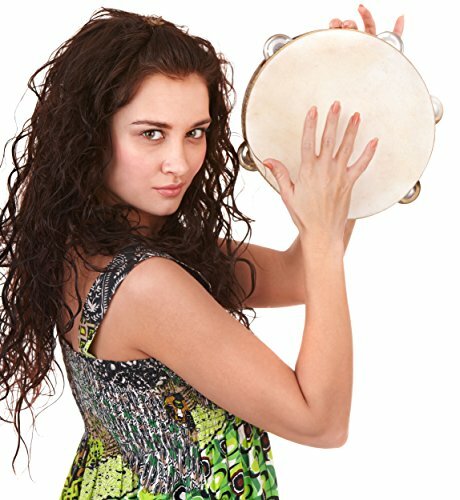 The 10 inches double row tambourine drum is well for all who love percussion instruments, music, and dancing. The tambourine has easily shaped grips and gently curved edges. This tambourine drum has 2 rows of metal jingles, totaling 16 pairs that create loud cheerful sounds. The handheld tambourine produces a great sound when shaken or thumped. This key percussion instrument will be a great addition to your dancing, karaoke or jam sessions, church choirs, or an excellent addition to your Drum set. This wooden tambourine drum is 10 inches in diameter. So this percussion instrument will be comfortable for children and adults.